Señor Frog's Restaurant is synonymous with Spring Breakesque craziness, but the restaurant coming to the Royal Hawaiian Shopping Center will welcome families for lunch and dinner. After that, it will be grown-up time in the irreverent restaurant that -- in its concern for the environment -- encourages water conservation through tequila drinking. The vibe notwithstanding, the restaurant business is serious business, and Mexico-based parent company Grupo Anderson will spend an estimated $8 million on the second-floor restaurant of about 14,500 square feet and its 2,000-square-foot ground-floor retail store. The company will hire about 150 employees, according to Development Director Jorge Hinojosa. The opening is scheduled for June. The flagship restaurant in Cancun has an in-house water slide that empties into a lagoon. People who don't win the restaurant's entertaining contests are sent by the staff emcee up the ladder to the slide and into the lagoon, which has orange construction fencing in it to serve as a barrier between the lagoon's alligators and the restaurant's clientele. Nobody said they had to lose that badly, after all. That's only part of where the wild and crazy reputation originated, but the company is sensitive to the alarm such things might cause in comparatively conservative America. 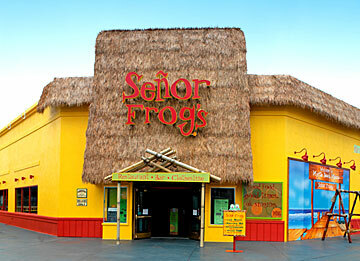 The Myrtle Beach, S.C., Señor Frog's is the only other company-owned restaurant in the United States so far. No such water slides or alligators are planned for the restaurant's U.S. expansion, which will include Las Vegas next year as well as Honolulu. Over the summer, Grupo Anderson opened its first company-owned Señor Frog's in Myrtle Beach, S.C.
Señor Frog's in Miami is no longer affiliated with the company. "We do realize that coming into a place like Myrtle Beach, that we would have to target more families," said publicist Ashley Hallmark. Many Señor Frog's locations are in the Caribbean and along the coast of Mexico "where major cruise lines come in and people are in more of a party mood," she said. Places like Myrtle Beach and Honolulu attract a lot of families and Señor Frog's will be "a very appropriate place to bring families." "We don't want families with small children to think it's a crazy bar scene atmosphere all the time where they would have to cover their children's eyes, that's not the image we want at all." The restaurant stages family-targeted contests and games, such as calling children up on stage to do the Chicken Dance, having moms and dads stand on their chairs and having a conga line snake through the restaurant, she said. The food at the U.S. Señor Frog's locations is a bit different from elsewhere, tweaked for American taste buds but using Mexican ingredients, which are explained in the menu's guide to "fancy Mexican culinary terms." Dessert is listed first because life is short, it says. Aqua Tacos are Mexican lettuce wraps served as appetizers, as is a melted blend of cheeses flamed with tequila and served with flour tortillas. The menu offers soups, salads, sandwiches, chicken, pork and beef dishes including a rib eye steak "for real men with real appetites. Upon ordering, you will be asked to demonstrate your muscles. If you fail the test, you will be given a small side salad and politely asked to leave the restaurant." A read through the irreverent and funny menu will be worth the price of admission. The restaurant will be open from 11:30 a.m. to 4 a.m. and dinner will be served until midnight, Hinojosa said. 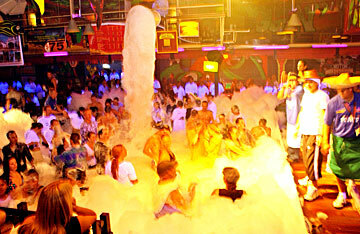 A "foam party" is pictured at the Señor Frog's restaurant in Puerto Vallarta, Mexico. Company officials have toned down the chain's wild image for its entry into the U.S. market, so they aren't sure whether such events will be held at the Honolulu restaurant. It plans live entertainment hired locally and from elsewhere. "We have a full-time emcee, and disc jockey, and we hire bands from different places and bring them to our locations," he said. Grupo Anderson is planning its U.S. expansion during the throes of recovery from Hurricane Wilma, which destroyed or severely damaged many of the company's 54 locations, including flagship stores in Cancun, Cozumel and Playa del Carmen on the Gulf Coast of Mexico. Based on Mexico's experience with another hurricane in 1988, residents were told it would be at least three weeks before electricity could be restored in Wilma's wake. "We had our electricity back in seven days," Hinojosa said. The three cities are responsible for about 80 percent of Mexico's tourism revenue, "so there's been a lot of effort by the local and federal government to get back really quick." In return for the emergency support, the government expects the hospitality industry to keep its employees working, which Grupo Anderson is doing. "Everyone's still on the payroll, earning money, helping, working with us to get the restaurants back on their feet," said Hinojosa. Some are already operating; others will be back in late December and others will take until early next year to restore. "We're very happy to see how all our employees embraced us as their own, working with their own hands, painting, collecting dirt and water, mopping floors, doing everything they can." 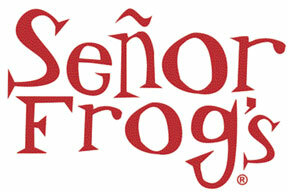 Señor Frog's construction work is expected to begin in January.